Our yard here on the Coffs Coast sees many bird visitors. They are a constant delight to observe. Some are more welcome than others so I guess we need to plant species that attract the birds that we'd most like to see. The following YouTube clip from Brad Walker has quite a few birds that are commonly found in our garden here on the Coffs Coast - Bird calls. One bird we enjoy seeing in our garden are wattlebirds, these honeyeaters also take care of some of the flying insect pests in the garden too. They can be a bit territorial about other birds 'on their turf' and chase them away from their favourite snacking shrub! Wattlebirds will often breed up to three times a year (providing conditions are conducive) thus giving them an opportunity in breeding some young ones successfully. Of the 10 Australian Kingfisher species, 6 are found in New South Wales with the laughing Kookaburra the largest at 46cm. The laughing Kookaburra is not really laughing when it makes its very familiar call - their cackle is actually a territorial call to warm other birds to stay away. Kookaburras hunt small snakes, lizards and rodents - I've observed them sweeping down and snatching a small lizard or worm an enormous distance from their perch - such efficient hunters! A very bold and curious bird is the Noisy Minor - it is very common here on the Coffs Coast. Because of their dominate and aggressive manner they have often 'run off' some of the little birds like the Red Browed finch and Fairy Wren. They feed on nectar, fruits and insects and very occasionally will eat small reptiles and amphibians. Due to its highly social nature these birds often feed in large groups. We as gardeners should provide small spikey shrubs to shelter the smaller birds and perhaps give them a chance to avoid the Noisy Minor. 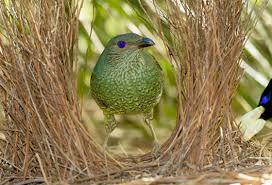 Bowerbirds - there are four found in New South Wales - Regent Bowerbirds, Satin Bowerbirds, Spotted Bowerbirds and Green Catbirds. For more detailed information about Bowerbirds please visit a post written January 2018. Magpies are birds of our youth, so very familiar to us for mainly giving us 'a serve' riding our bikes in Spring! The Australian Magpie walks along the ground searching for insects and their larvae. They are very adept at accepting any offerings from humans and are known to 'beg' for food. They are quite tame with the exception during breeding season where some individuals become quite aggressive towards any intruders and will swoop with terrifying affect! 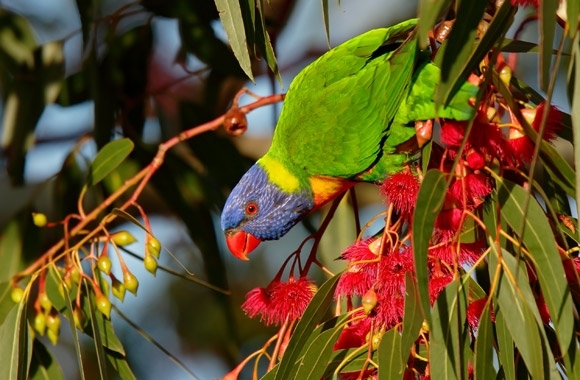 Rainbow Lorikeets are unmistakable with their bright red beak and wonderfully coloured plumage. They are often seen in noisy, loud and fast-moving flocks and just love our bottlebrush trees where they forage for nectar and pollen, but they also eat fruits, seeds and some insects. They are widespread along the Coffs Coast. Another pretty bird is the Eastern Rosella which is a medium-sized parrot with distinctive white cheek patches and a red head, neck and breast with yellow/green upper parts and a yellow underbody. They feed on the ground, especially feeding on seeds from grasses. They do eat fruits, buds, flowers nectar and insects. We see them happily eating the seeds from the many weeds growing in our rose garden! 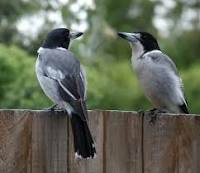 Grey Butcherbirds are quite aggressive predators - they prey on small animals, birds, lizards, insects and eat some fruits and seeds. These opportunitists take full advantage of every opportunity to forage - they follow our lawnmower and pounce on food that is made visible and when I weed the garden they are often there keeping me company to eat any curl grubs I find (it is an absolute delight to see them catch these mid air...). Most of their prey is caught on the ground and feeding normally takes place alone, in pairs or small family groups. The birds in this post are ones that frequent our garden regularly - there are many, many more of course - including some pretty special waterbirds who enjoy our dam.